In October of 2015, Kim asked via email if I happened to have a recipe for morning glory baked oatmeal. Kim mentioned that her brother had purchased something similar from Zig’s Bakery at Lancaster Central Market and kindly shared some with her. It was love at first bite, and she wanted to make some on her own. Morning glory muffins found their fame in the early 1980s after an appearance in Gourmet Magazine. Pam McKinstry had created the recipe several years prior to serve the patrons of her Morning Glory Café on Nantucket. In 1991 the muffins were chosen as one of the magazine’s 25 favorite recipes from the past 50 years. And no wonder. 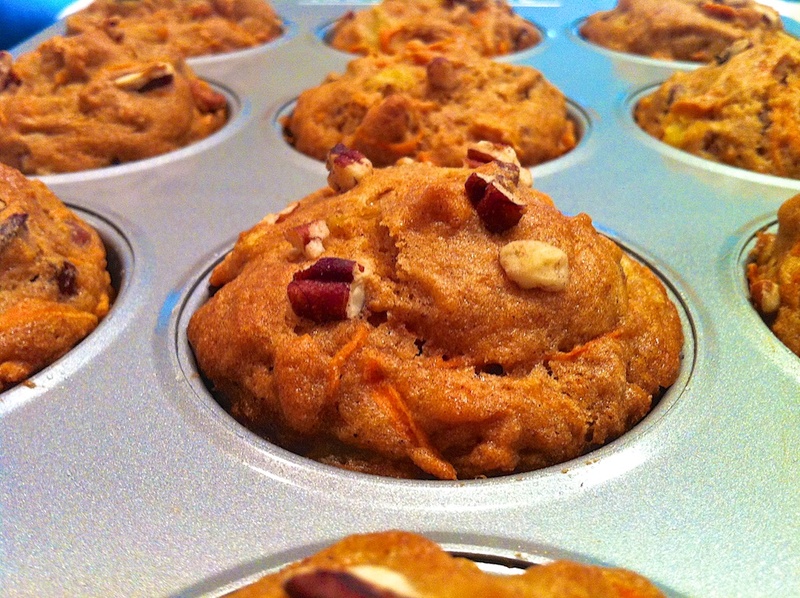 The flavorful muffins are lightly spiced and loaded with nourishing fruit, veggies, and nuts. 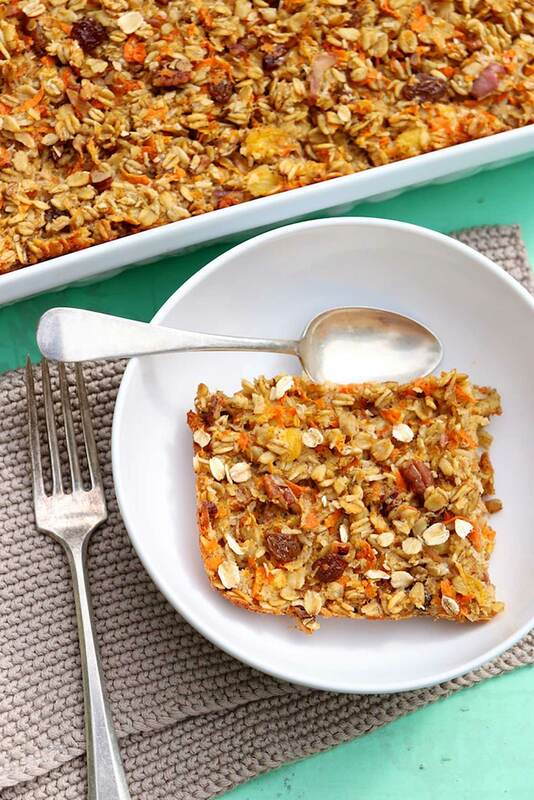 When transformed into baked oatmeal, hearty whole-grain oats replace the flour, supplying added nutrients and staying power. As luck would have it, I was in the formative stages of a carrot cake baked oatmeal that was quite similar to Kim’s request. I emailed my recipe to Kim, mentioning that it was still a work in progress. My family had enjoyed the recipe as written, but I had a few adjustments in mind, so I mentioned those in case Kim wanted to try. In Kim’s words, the oatmeal was excellent. 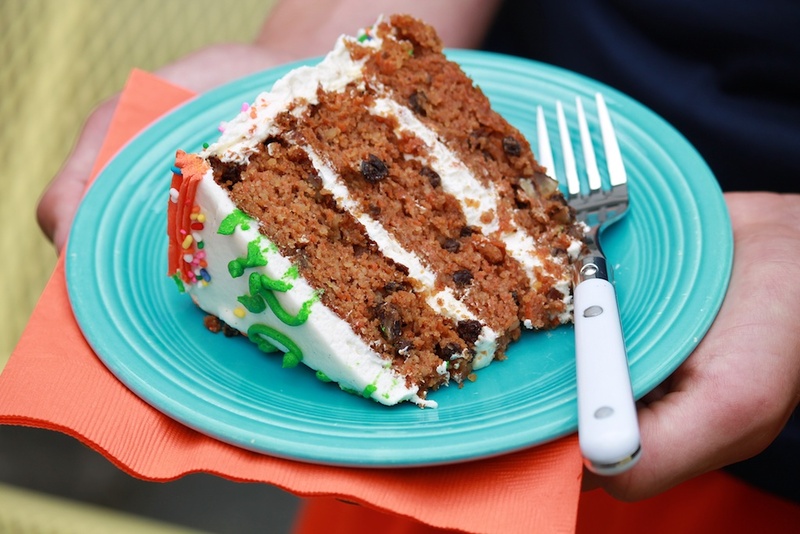 So you may be wondering why it took me two years to share the recipe! Baking is regarded as an exact science, yet years of trial and error have taught me that baked oatmeal recipes tend to be both flexible and forgiving. Accordingly, every time I made this recipe, I’d adjust a factor to see if I could make it better. With the return of cool mornings, the warming flavor of this recipe began calling my name, and I went back to my recipe notes. After making no less than six casseroles in the past month (and looking forward to breakfast each and every morning), I decided it was time to publish. The recipe below is chock-full of healthy add-ins and relies as much as possible on the fruit’s natural sweetness. I reduced the brown sugar to the lowest amount that my kids still enjoy, but you could reduce it further if preferred. Conversely, if you find the finished product not sweet enough, add an extra sprinkle of sugar or drizzle of maple syrup on top, and then bump up the sugar by a few tablespoons the next time. Similarly, if you prefer an all-natural sweetener, use maple syrup or honey in place of the brown sugar. You’re probably starting to get the point! But there’s more. Two eggs will do the job; three provides more binding power with a bit more denseness. If you don’t like coconut, skip it. If you don’t do dairy, use almond or coconut milk (we do eat dairy, but I often bake with Silk’s unsweetened almond-coconut milk and enjoy its subtle flavor). Initially, I thought an eight-ounce can of crushed pineapple was a bit too much, so I reduced it to half a can. After all the other changes, I increased the amount incrementally and ended right back at the whole can (which conveniently avoids unneeded extras). If you’re tempted to use less, simply make up for the difference with extra liquid, be it in the form of milk or even an egg. A fresh, sweet apple adds excellent flavor and moisture to the oatmeal. In a pinch you could use a four-ounce cup of applesauce. Still, you’ll need the get out the grater for the carrots. I consider them non-negotiable, and the store-bought, pre-shredded variety tends to be a bit too coarse and dry for this application. So while I encourage you to make the following recipe as written and am optimistic that you will enjoy it as much as we do, I’m giving you full permission to tweak the recipe according to personal preference. The odds of success are in your favor! The recipe makes a big pan-full, and the flavor improves over time. After the oatmeal has completely cooled, I cover and store it in the refrigerator where it will keep for the better part of a week. It freezes well, too. Feel free to bake a day ahead to have a delicious breakfast at the ready. While the baked oatmeal is fantastic hot out of the oven, the flavors meld overnight and it's equally good--some say better!--the next day. The baked oatmeal will keep for about a week in the refrigerator, if it lasts that long, and may be frozen. Grease or butter a 9×13 baking dish; set aside. Lightly beat the eggs in a mixing bowl, and then add the remaining ingredients except the oats. Mix well. Add the oats, and stir to fully incorporate. When ready to bake, uncover the oatmeal and preheat the oven to 375 degrees F. If the oatmeal has been refrigerated, allow the baking dish to sit on the counter while the oven preheats. Bake for 30 minutes, give or take a few based on individual oven, or until just firm in the center. May serve with warmed milk, additional nuts, and/or sliced bananas. It’s delicious eaten plain, too. Cover and store leftovers in the refrigerator. Reheat gently in the microwave or enjoy cold. *I use unsweetened coconut, but sweetened coconut may be used if preferred. If you’re not a coconut fan, simply omit. The same goes for the raisins, although these do contribute to the natural sweetness in the recipe. If omitting, you may wish to increase the brown sugar to 1/2 cup or so. Tip: It’s helpful to bring your ingredients to room temperature before mixing so that the coconut oil or butter doesn’t re-harden when combined with the cold milk and eggs. If this happens, you may warm the mixture in the microwave just enough to melt and incorporate–but not enough to cook. …or these wholesome muffins. The muffins are healthy yet so tasty, I sometimes frost them and serve as cupcakes! I baked this yesterday to enjoy this morning and it did not disappoint. Two thumbs up from everyone in the family! Great news! I’m so happy it was a hit! I made this a couple of days ago and it is delicious. Thanks for letting me know and so glad you enjoyed! 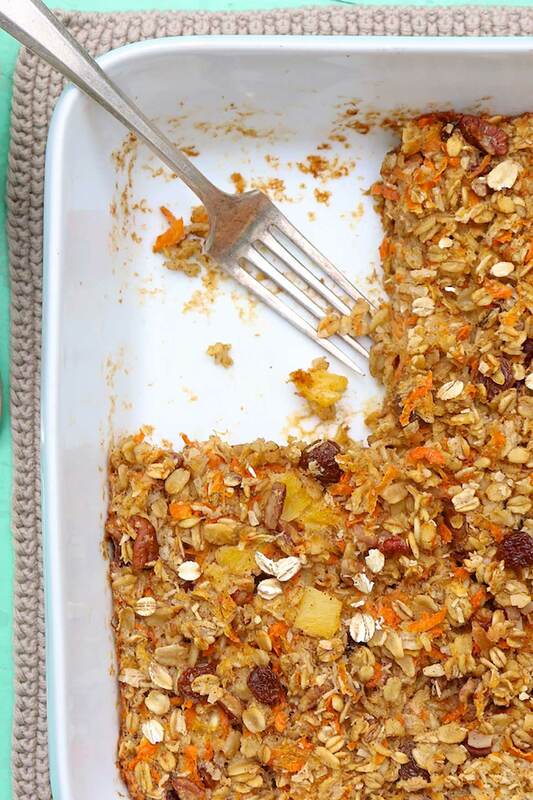 I made this yesterday and my husband said that it might just be his favorite baked oatmeal recipe of all time. A definite keeper…and possible a weekly occurrence! Awesome feedback, Nancy. I’m delighted it’s a keeper! Hi Wilma, Baked oatmeal is somewhat dense, yet there should be some rise to it. If yours didn’t rise at all, perhaps the baking powder could be in need of replacement? If you don’t think that’s the culprit, let me know and we can try to figure it out! This has become my new favorite. It’s loaded with so many healthy ingredients AND it tastes amazing! So glad to read your comment, Emily. Glad it’s a keeper! I have a question about the consistency of the baked oatmeal. I followed the recipe, but mine was crumbly and wouldn’t stay together as a square. I am wondering how I could change that. Hi Lynn, The consistency isn’t quite the same as a muffin, for example, but it shouldn’t be crumbly. My guess would be that there were too many oats or not enough liquid…or perhaps your eggs were on the smaller side? To fix this, I would start by measuring the oats carefully and leveling the cup off with a knife. I’d add another egg or egg white, and you could add another 1/4-1/2 cup of milk. I’d decide based on how much binder you think you want. Know that these additions will not cause the recipe to fail. I’ve made this oatmeal with all of those options. 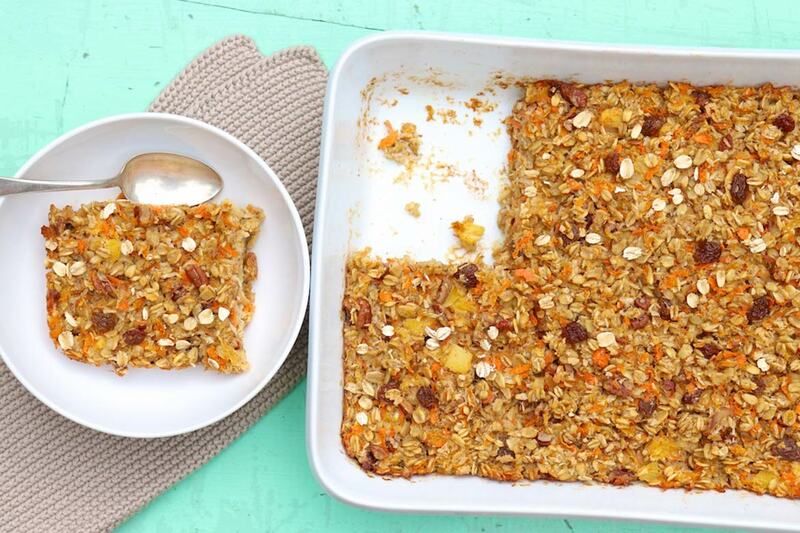 Baked oatmeals are flexible and forgiving and it ultimately comes down to personal preference. I hope that helps! If you have anymore questions, don’t hesitate to ask. P.S. For the current batch, you could drizzle a little milk into the squares once they’ve been warmed, and then warm for another short burst. Just had to let you know that this has become one of my absolute favorite breakfasts!! The first time I made it I used 2% milk (only milk I had on hand) and “Craisins” as I’m not a huge raisin fan… it was very good. I made the recipe exactly as stated but didn’t have time to let it sit on counter or in fridge so I cooked it immediately after preparation… It cooked for nearly an hour before it was done, but it is ABSOPURELY SO DELICIOUS!! Quite hearty and filling, and I know that I’m putting nutritious and healthy things in my body! Thank you for posting this… I LOVE LOVE LOVE IT! I just browsed that recipe, Ann… OH YUM! I cannot wait to try it! I’ll keep you posted. Your brain works like mine does…you sound like so much fun! I might just borrow those words, and do keep me posted! Hi, these all look delicious but can you say how many calories per serving ? Hi Cristina, I don’t typically calculate nutritional stats, but here’s a user-friendly link that you might find helpful: https://www.verywell.com/recipe-nutrition-analyzer-4129594. 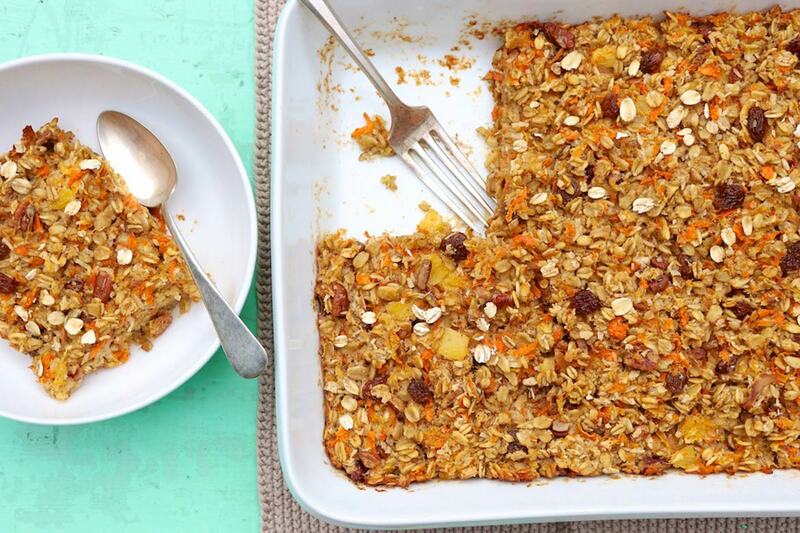 If you try the baked oatmeal, I hope you enjoy it! I made this with the addition of small shredded zucchini and an additional egg. Very yummy and filling! Wonderful, Jennifer. I’m so glad you liked! I’ve been making this every week for the past month and it’s my new favorite breakfast. So nice to have it on hand plus it holds me over until lunchtime. I love how filling this is, too, Lisa. I’m glad it’s a keeper!